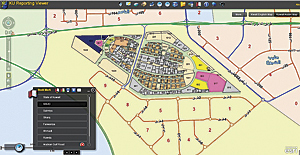 Because of Kuwait University's GIS vision, it is receiving the floor plan designs in geodatabase format. ArcGIS for Server and ArcGIS for Windows Mobile are used to manage campus assets. GeoDesign plays a significant role in the complex world of adaptive management throughout the construction process. Kuwait University is embarking on one of the most ambitious campus development projects in the world. The massive University City is being designed and built from the ground up and will emerge over the next four years of construction as part of a multibillion-dollar development initiative. All the university's information is stored in a geodatabase and is easily accessed using a Flex viewer. In addition to teaching GIS, Kuwait University chose to apply the geospatial concepts discussed in the classroom to support the entire process of designing, building, and operating the huge new University City at Shadadiyah Campus. In early 2010, Kuwait University recognized a need for specialized consulting and documentation of requirements for geodatabase design of the Sabah Al-Salem University City project. For the plan to be successful, the needs of both planning company Turner Projacs and Kuwait University were to be incorporated in the details of design and construction of the project. Those needs included using GeoDesign processes and techniques to bring value to each stage of the facility life cycle, from site analytics and design to planning and construction, as well as operations, security, and sustainability. This ambitious vision posed many challenges and represented a level of enterprise data development unmatched in the world today. To address these complex challenges and establish a common information foundation throughout the entire life cycle, Kuwait University turned to OpenWare Information Systems Consulting Company, Esri's distributor in Kuwait. Esri's reputation and proven performance in the enterprise GIS arena made it a natural place to start framing a system architecture to support the vision. OpenWare, along with Esri Partner PenBay Solutions LLC, headquartered in Brunswick, Maine, and Turner Projacs, based in Doha, Qatar, used GIS expertise to create a strategic road map for understanding the milestones and level of effort of this facilities information infrastructure project. Project progress performance indicators can be observed in a 3D view of the campus. One of the major challenges in addressing the scope of these ideas was how to model and store data for an entire campus—data spanning indoors, outdoors, and underground, connected and temporal. The process that ensued was a major effort to bring international experts to the table to design a unique, world-class data model for implementing this vision in GIS. The result of this effort is one of the more remarkable all-encompassing data models ever implemented—one which will support the full life cycle of Kuwait University's vision and beyond. The goals of the project included establishing a powerful GIS system for the new university based on a comprehensive geodatabase that integrates as-built design data. ArcGIS for Server, along with ArcGIS for Windows Mobile and many web applications created with ArcGIS Viewer for Silverlight, is used to manage the campus assets and provide a platform for future geospatial needs. 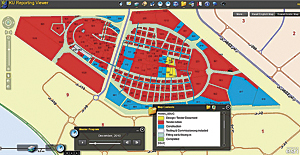 Using ArcGIS as the foundation technology, the project team has created a number of advanced applications. Coordinating a design and construction job of this size and duration requires a small army of dedicated experts and many years of planning and revisions. The project is engaging firms from around the world to design specialized structures for the 100-plus proposed buildings on campus. The master planning process is one of the first places where GeoDesign plays an integral role, optimizing program elements and unifying the designs from individual bid packages into a single seamless view. By doing so, planners and decision makers can recognize design impacts and understand considerations that would be missed without a holistic understanding of the sum of the design parts. Esri technology allows the team to do this in 2D and 3D, both important at different points in the master planning process. At the peak of construction, there will be more than 10,000 construction personnel on-site daily and untold vehicle trips requiring access to building sites for deliveries. The construction management team is a seasoned group of professionals that has traditionally worked through planning and daily operations using paper drawings and markup pens. Through the use of GIS, team members can now retrieve, update, and analyze construction logistics and scheduling data, temporary staging locations and assignments, and daily operations across the entire campus through a simple web viewer. Daily standup meetings utilize this information through the Construction Management viewer and allow quick sketching and markup, which is printed and taken to the field. This quick temporal snapshot helps meet the demands of the day, as well as the longer-term planning activities, to make construction logistics run smoothly. Status reporting is easy with the master plan map. Because construction implementation rarely occurs without the need for a design change, the GeoDesign process includes an adaptive management piece that allows design changes and impact assessment mid-implementation to ensure that program goals are met and the design change has no unforeseen impact on other design elements. Equally important is the visualization of construction over time (4D). Construction managers and decision makers can view and identify spatiotemporal clashes, accessibility problems, and other logistical issues before they happen. As the project progresses, reporting and schedule monitoring are critical aspects of project controls. Because so many tasks are dependent on other critical milestones, there needs to be a razor-sharp view of progress for all the ongoing activities. The GIS Reporting web application takes data from the tabular project report and displays it on the map, showing where activities are falling behind and which adjacent efforts might be impacted. This quick visual reporting accompanies all progress reports for a full project snapshot that can be easily understood by anyone on the project team. Another way of visualizing progress and key performance indicators is in a 3D GIS view of the campus. Using ArcGIS and ArcGIS Explorer, project leaders and executives can view an up-to-date snapshot of building construction progress in 3D or request high-level reports. While the campus buildings are not going to be completely finished and occupied for years, there is a requirement to begin the massive process of space programming for the academic occupancy. 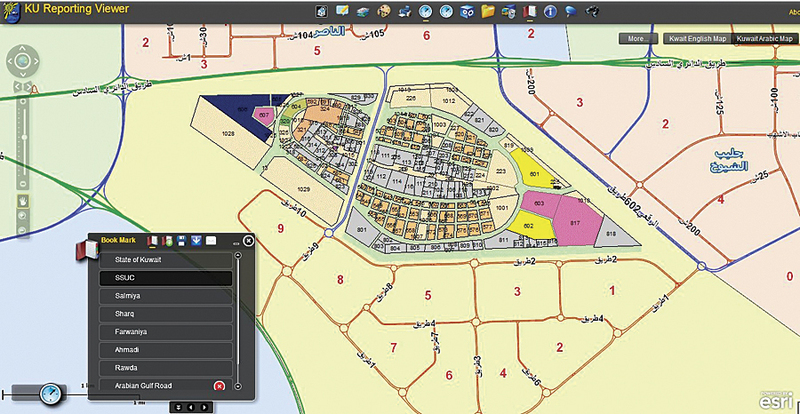 Because of Kuwait University's GIS vision, it is receiving the floor plan designs in geodatabase format. This means that even prior to completion of construction, university staff will be able to do scenario planning with that data, assigning personnel and assets to define an optimal space program. It also supports validation of space requirements by size and type, as well as proximity to building services or required facilities. This is done for each floor, throughout the entire building and out to other buildings. The benefits of using GeoDesign processes to support facility life cycle management are numerous. The use of GIS strengthens and streamlines the design and construction phases of the campus development process and implements key applications to support operations management while establishing a GIS infrastructure that can be expanded to other advanced application areas. This project encourages the development of a campus GIS unit that works in conjunction with the current team to start building a core technical capability to eventually take over the operational system and expand to future applications. Additionally, the same technology and much of the data may be useful for helping support academic programs, including a living laboratory that students can use to develop new application ideas. For more information, contact Ann Marie Lynch, PenBay Solutions (e-mail: alynch@penbaysolutions.com), or visit www.penbaysolutions.com. For more information on how GIS assists organizations around the world in their facilities management needs, visit esri.com/fm. Also visit esri.com/geodesign.